Over the last couple of weeks, since having my pregnancy belly masking done by Cassy at Signature Sculptures I have been working on finishing painting my design on to the cast. I finally finished it today and just couldn’t wait to share it with everyone. Unfortunately because we want to keep Squiggle’s name a surprise until his arrival into the world I can’t share the cast properly and to it’s full effect. In the meantime, I can however show you all a photo with the name blurred out and when he does make his entrance I will post another photo of the completed belly cast. I plan to also put his date of birth and hand prints on the belly, so once that is all done I will be sure to share my hard work with you all. I hope you enjoy this little sneak peak of what has kept me busy recently. The design is of a dragon to represent the Chinese new year of the Dragon (this year, the year Squiggle will be born). It of course includes his name, eventually DOB and hand prints. 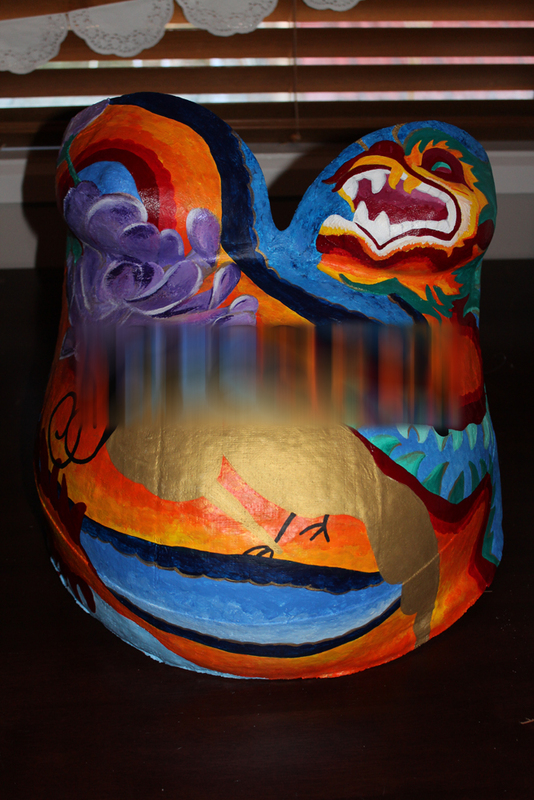 It is very vibrant and not your typical pregnancy, baby belly cast which is exactly what I was aiming for with the design. This cast will be the center piece for an arrangement of special items of my pregnancy and the birth of our little man. (The photo really doesn’t do it justice until I can share it with our baby’s name. Casting by Signature Sculptures, Artwork by myself: Melissa Scheuber).